Beth Lawrence's pieces subtly represents the ineffably strong connection a mother shares with her child. Artist Beth Lawrence created this stunning yet simple necklace, along with a bracelet and a pair of earrings, while she was pregnant with her first child. Thoroughly modern and extremely meaningful, her pieces subtly represents the ineffably strong connection a mother shares with her child. 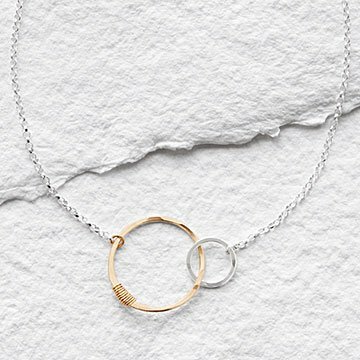 A gold filled ring adorned with twisted wire is permanently entwined with a smaller, sterling silver hoop and suspended from a sterling silver chain. A wonderful gift for new mothers, grandmothers, sisters, or best friends, the joined pieces are evocative of the infinite connection we possess with the special people in our lives and a reminder that they're always there for us as we carry on through life's struggles and successes. Handmade in Nashville, Tennessee. Gift for a special friend. We got two of these necklaces to give to our daycare providers on our child's last day. They've become like family and I wanted something that showed the love and connection that will always be shared between them and our child. They loved them! The two tone is great for matching everyday outfits. The 18" chain is a little short so I added a chain extender and it was perfect. Great quality, and a wonderful gift. I purchased this necklace a while back. Recently, someone broke it. I immediately ordered a new one because I like it that much and wear it way more than several of my other necklaces. This gift was for my wife. She love it. The meaning of the necklace fit perfectly with our 3.5 years old son bonding with his mom. Very pretty piece, looks like the online photo. The piece includes a card of the artist and another card that outlines the meaning behind the rings. . Gave this necklace as a gift. It was perfect! Best mother and child necklace - simple, elegant and modern.